"Senex" redirects here. For other uses, see Senex (disambiguation). The wise old man (also called senex, sage or sophos) is an archetype as described by Carl Jung, as well as a classic literary figure, and may be seen as a stock character. The wise old man can be a profound philosopher distinguished for wisdom and sound judgment. This type of character is typically represented as a kind and wise, older father-type figure who uses personal knowledge of people and the world to help tell stories and offer guidance that, in a mystical way, may impress upon his audience a sense of who they are and who they might become, thereby acting as a mentor. He may occasionally appear as an absent-minded professor, appearing absent-minded due to a predilection for contemplative pursuits. The wise old man is often seen to be in some way "foreign", that is, from a different culture, nation, or occasionally, even a different time, from those he advises. In extreme cases, he may be a liminal being, such as Merlin, who was only half human. In medieval chivalric romance and modern fantasy literature, he is often presented as a wizard. He can also or instead be featured as a hermit. This character type often explained to the knights or heroes—particularly those searching for the Holy Grail—the significance of their encounters. In storytelling, the character of the wise old man is commonly killed or in some other way removed for a time, in order to allow the hero to develop on his/her own. In Jungian analytical psychology, senex is the specific term used in association with this archetype. In Ancient Rome, the title of Senex (Latin for old man) was only awarded to elderly men with families who had good standing in their village. Examples of the senex archetype in a positive form include the wise old man or wizard. The senex may also appear in a negative form as a devouring father (e.g. Uranus, Cronus) or a doddering fool. 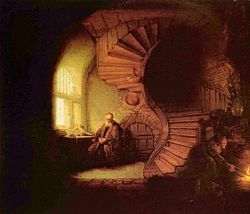 In the individuation process, the archetype of the Wise old man was late to emerge, and seen as an indication of the Self. 'If an individual has wrestled seriously enough and long enough with the anima (or animus) problem...the unconscious again changes its dominant character and appears in a new symbolic form...as a masculine initiator and guardian (an Indian guru), a wise old man, a spirit of nature, and so forth'. The antithetical archetype, or enantiodromic opposite, of the senex is the Puer Aeternus. Jiang Ziya, a genius and patient old man. He was well known as a legendary military strategist and the most famous Prime Minister of the Zhou Dynasty of China. Nguyen Binh Khiem, also known as the White Cloud Hermit. He is a saint of the Cao Dai religion and the most prominent person of Vietnam history in the 16th century. Zarathustra, the Persian avestan sage with a dualist cosmology and theogony in perpetual tension between good and evil. In fiction, due to the influence of Merlin, a wise old man is often presented in the form of a wizard or other magician in medieval chivalric romance and modern fantasy literature and films; notable examples include Gandalf from The Lord of the Rings and Albus Dumbledore from Harry Potter. See List of magicians in fantasy for more examples. The Elder Kettle, who serves as a father figure to the Cup Brothers in Cuphead, closely follows this role. When the brothers get roped into The Devil's scheme to gather the contracts, it is the Elder Kettle who helps the brothers in their plan to eventually turn against their master. "Senex" is a name of a wise old character in the novel A Wind in the Door by Madeleine L'Engle. Around the 1850s, the antiquarian Robert Reid used the pseudonym "Senex" when contributing articles on local history in the Glasgow Herald. These were later published in a series of volumes. Sir Alan Lascelles used the pen-name "Senex" when writing to The Times in 1950 setting out the so-called Lascelles Principles concerning the monarch's right to refuse a prime minister's request for a general election. A character in episode 7 of the anime Ergo Proxy is named Senex Proxy, and is the Agent of Moonlight. She is killed by Ergo Proxy. It is possible the name Senex is in reference to the age, and immortality of the Proxies. In the roleplaying game Mage: The Ascension, Senex is the wise old leader of the Euthanatos magickal tradition. He dwells in a far distant realm, only rarely stepping onto Earth. ^ Doob, Penelope Reed (1990). The Idea of the Labyrinth: from Classical Antiquity through the Middle Ages. Ithaca: Cornell University Press. pp. 179–181. ISBN 0-8014-8000-0. ^ Chalquist, Craig (2007). Terrapsychology: Reengaging the Soul of Place. Spring Journal Books. ISBN 978-1-882670-65-9. ^ Franz, Marie-Luise von (1978). "The Process of Individuation". In Jung, C. G. (ed.). Man and his Symbols. London: Picador. pp. 207–208. ISBN 0-330-25321-2.